Hey guys and what is up? Hope you all feel interested and hungry for this month’s yummy box. Shall we begin? If you don’t know what Flavourly is; you should really check them out. They’re a really quality subscription box for only £15 ($25) and every month they send out some delicious items from the smaller businesses that you may not have heard of. This gives a change for not only us to try some amazing food but it helps the smaller businesses grow and spread to more people. All links will be at the bottom of the post. 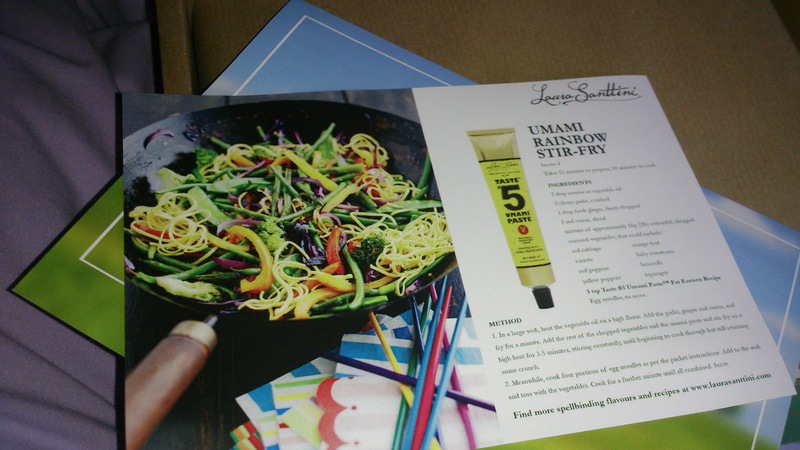 This is the item used on the recipe card; Umami paste. Umami is the Japanese ‘5th flavour’ which makes everything savory taste one step beyond. It can be used for everything, most noticeably for noodle soups because this paste just turns it up to 11. 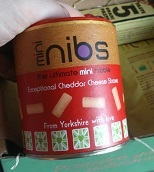 These are mini nibs by nib nibs. These are finest ingredients mixed together to make the most delicious and filling mini cheese straws. They are buttery, crumbly, snack-sized and are absolute heaven for any cheese lover. For those who like to be more adult about their popcorn, you really need to pop onto the website and find these. 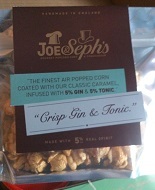 Gin and Tonic flavoured popcorn…HOW COOL DOES THAT SOUND :D. They don’t just stop there, these guys range from gingerbread, white chocolate and yummy caramel to cheese on toast, goats cheese and black pepper and madras curry. 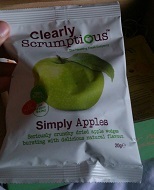 Best thing is that, when I tried these, they were not all soft; they were still crisp and tasted delicious. Yet again another thing from Clearly Scrumptious. These are dried apple slices, the don’t taste as strong as other products but do have a very nice, refreshing taste and are perfect as a snack. QUIBBLES are by far the best name for food and they taste so good. You can tell by the picture I was ready to dive right in, but I took a picture before. 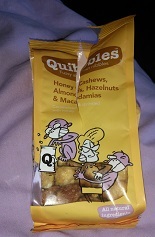 Quibbles are mixed nuts that come in various flavours, in my case they were honey roasted cashews, peanuts, almonds and macadamias…they’re all gone now and I wish I had more. Once again making an awesome snack for people on the go. Heaven given fluffy form. 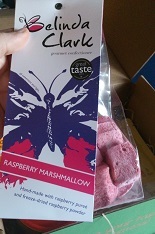 These are amazing raspberry marshmallows from Belinda Clark and are by far the softest and most delicious marshmallows I’ve ever had. They’re not kidding when they say the use the finest ingredients for these little cubes of loveliness because you can really tell the difference between these and average shop bought mallows. They do a lot more flavours that this; they also do mango, strawberry and do have gift bags to carry the amount of marshmallows you’ll want to by. They would make the perfect gift. Another item in the box is something I’ve been having quite regularly because it’s one of the best things to have before bed and even to help when you’ve got a little cold. 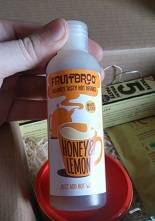 This is liquid tea by Fruit Broo. I have honey and lemon flavour and the idea is to add one or a couple teaspoons of it in a cup and pour in some hot water and that’s it, it’s so easy for something so flavourful. 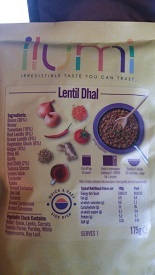 Lastly is a lentil dhal meal kit, which I have not tried yet. Thanks for reading guys and gals, If you like this post please give it a like and if you have any questions, feel free to leave a comment. If you are interested in getting this box, please use the flavourly link below as it’ll save you £5 off your first box and helps me out a little too. First thing is first; explaining the picture. 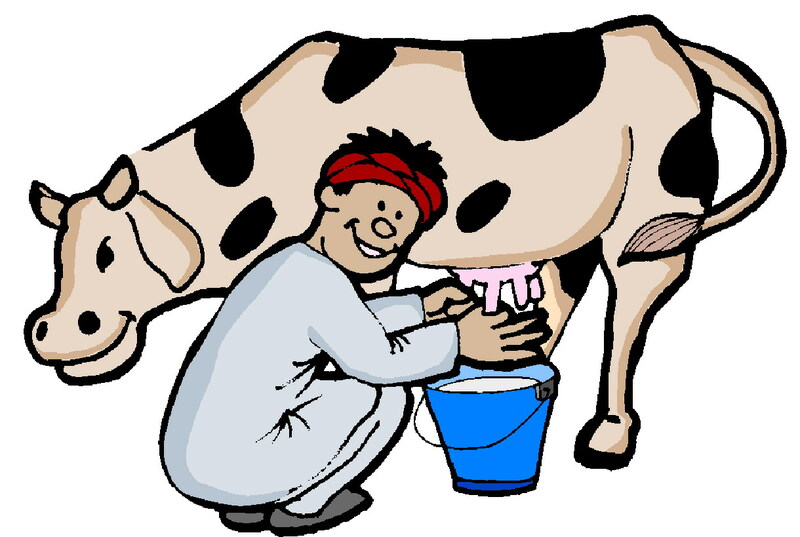 The reason for this lovely picture (courtesy of Google searching “Clip art”) is that I feel like I’m milking the apology curve, but I really need you to know what is going on. The house where I am is getting stuff done to it like the piping for heating being renewed…etc; which means all of my floorboards are to come up. Now, I don’t have the biggest room so I need to take down my bed, box-up nearly everything and turn a few things back into ‘flat-pack furniture’. Therefore I need to let you know there will be periods of time where I won’t be posting; including YouTube videos, which I’m really enjoying knowing that there are people who are trying to help me by subscribing and liking the videos. I’ll leave a link for the newest video further down; there will be another video up later. I promise that tomorrow i’ll post up the unboxing for my April flavourly. Thank you, everybody who cares to read this or watches/glimpses at my YouTube videos. You’re all awesome. Let’s Play L.A. Noire part 15 – Shrunken head, among things!